All Pro Restoration works with all insurance companies. Our owner is Master Certified in Water Restoration, which includes certifications in mold remediation, and he personally trains all of our technicians. Everyone at All Pro Restoration is passionate about superior service with a smile – and that is the All Pro Difference! Storms can wreak havoc on your home or property and this can be very unnerving. 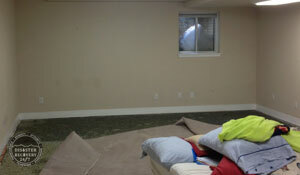 Basement flood damage is the most common type of damage during a storm. However, leaking roofs can also cause storm damage. Storm damage can be caused by hail storms that fill up window wells and cause flooding, flash flood rain storms that cause over saturation of the ground and therefore water seeps in through your foundation walls, and even flash floods that create so much water that the city sewer system cannot drain the water fast enough and therefore sewer water comes in through your sewer line. If you have experienced damage to your home, from a storm, that is allowing intruding water into your home, it is important that you stay calm. This can be taken care of easily by our professionally trained technicians. If you have been unable to locate the source of the water, contact All Pro Restoration right away. We have the tools and technology to detect moisture that is coming from unknown sources, quickly and efficiently. Thermal imaging and moisture meters will help us narrow in on the source of the storm damage, but will not always provide an exact cause. Our technicians will help determine the cause but may not be able to provide an exact answer. We may have to refer you to another specialist. Storm damage caused by a window well filling with hail and leaking into the basement through 3 windows in the home. While you are waiting for a technician to arrive on site, it is recommended to use any means available to remove any standing water. This will help alleviate some of the storm damage that can occur from standing water. Move affected belongings from the area to prevent further moisture wicking. Refrain from using air movement on the affected area due to unknown contaminates that may be present. Stagnant air will help prevent the air borne spread of these contaminates. If left un-treated, storm water can produce fungal growth inside your home such as mushrooms, mold and more. This fungal growth is from the unknown contaminates such as fertilizers, animal feces, dead organisms, etc. If your home has been affected by a recent storm, call your 24/7 Restoration Professionals today.